It is known as the "capital of Peruvian Amazon", an important trading port in the Amazon basin and the closest city to Amazon River on Peruvian side. The largest city along the Amazon River is Manaus in Brazil. The largest city in the world that is inaccessible by road and yet can be reached by ocean vessels (of certain weights and certain height of draft) from Atlantic Ocean, 3600 km away. Surrounded by Amazon, Nanay, and Itaya rivers. Benefited greatly from the great rubber boom during 1880-1914, and was one of the great lead cities until the rubber seeds were smuggled out of the area and replanted in British colonies in Asia, such as Malaysia. The cheaper Asian rubber undercut that of South America, therefore, the Peruvian boom came to an end. Iquitos is the noisiest city in Latin America; its noise level is up to 115 decibels exceeds the desirable level (70 dB) indicated by the WHO. Amazon River - very wide and in muddy color. Iquitos was indeed a very noisy city. Some blamed on its public transportations such as the tuk-tuk above. Amazon River, the world longest and largest (in terms of discharging of water) river, has always fascinated me ever since it was first introduced to me in third or fourth grade. 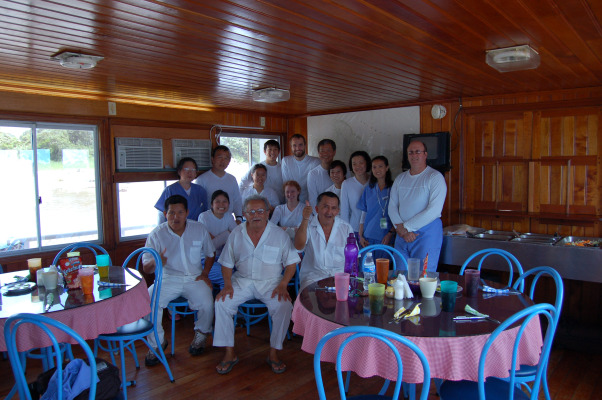 In December of 2008 I tagged along with a medical mission team from my church to this part of the world. It was my first medical mission work, and hopefully would not be the last. We were in and out of Peru via Lima. From Lima we took very early flight to Iquitos. First interesting fact I learned was that all flights into/out of Iquitos are either in early morning or late afternoon to avoid plane crash caused by birds. Sunrise from the plane - on the way to Iquitos. In addition to providing medical care, we tried to serve the Amazonian people by bringing them the necessities of daily life, such as tooth brush, tooth paste, stationary, and prescribed glasses, and educating the usage. Three doctors were on our team and the rest is of different professions. Chosen Vessel was our means of transportation and accommodations in Amazon River. All our supplies, including food and water, was on this vessel. Our cafeteria. The three gentlemen at the front were the helpers of this vessel. 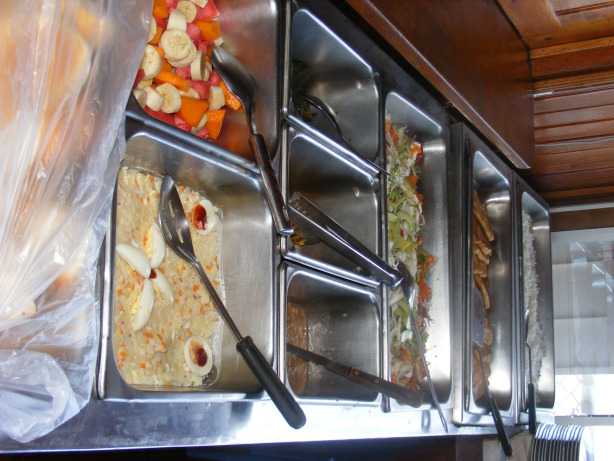 To avoid unnecessary food related illnesses, we ate only food served at the vessel. The same with water..
Our social deck on the vessel. Our bedroom. The bathroom was also in the unit. By day we docked at somewhere in Amazon river and took smaller boat (due to shallower water) to different villages for providing the local residents medical care; by night we(the vessel) traveled to our next village. Sunny day on the boat to/from villages. Rainy day to/from the villages. None of the teammates spoke Spanish. The language barrier was solved by hiring five translators for our time in Iquitos and Amazon river. Each doctor had a translator assign to them. The remaining two translators assisted us at the booths when we educated the people concerning the necessities we gave them. Medical care was provided in the morning; Gospel message was delivered using skits in the afternoon. Activities with children included story telling, games, and coloring. According to my doctor friends, the majority of their illnesses were water related. With proper water treatment, these predicaments would disappear. Amazon river was their main source of water used for practically everything and without water treatment. In some way it reminded me of the india's Ganges river. Villagers waited patiently outdoor. One of the patients. He was blind. Walked to the village from the river. When leaving, the villagers would walk us to the boat and waved till we disappeared. Their gratitude was greatly appreciated. If my memory still served me right, river people here don't really have three meals a day like we do. Most houses were (back in 2008) still without electricity and live with their livestocks running around them. At night, after giving our nightly report (via satellite phone) to our point of contact in USA, we fished. My dream of catching some pirancha here was never materialized. Fishing in Amazon River might require different skillset and/or different kind of baits. My baits, when in water, were bitten without notice. We only managed to catch pitifully tiny fishes. This little boy showed us the pirancha (in his hands) he caught with the sticks in his hands. The baits were flesh bloody meat. Our "civilized" baits were no attractions to the local fishes. Note: Pirancha is a rather scary looking fish with big teeth which are out of proportion to its overall size. Stargazers would be thrilled in Amazon River. In the absence of electricity generation and pollution, one could look up to the crystal clear sky and be in awe of the fact that "the heavens declare the glory of God". It was a pitch darkness in our surroundings. Apart from the limited motor-generated light in our boat, those twinkle stars was our another source of light. My teammates enjoyed identifying those stars; a lousy astrology student that I am, I simply enjoyed the transquility of darkness on Amazon River, knowing this might be once in a lifetime experience. Two great take-aways from this trip: 1) the children there reminded me of my colorful childhood that was devoid of electronic gadgets. We occupied our time with outdoor activities in the nature, such as fishing, playing crickets and etc. Seriously even now I still am not sure if electronic gadgets do us more than harms than its intended benefits. 2) I walked away a much grateful person, more appreciative of the beautiful and bountiful America. You can find more information about the Chosen Vessel Medical Mission here. The founder and his wife are Mike and Susie Dempsey. After Iquitos, we spent a couple more days in Lima for some sightseeing, shopping, and eating. We visited the ancient site Huaca Pucllana and the downtown area. More pictures below in the sliders. Along Amazon River, tourists stay on these luxurious boats for jungle/river exploration. White sandy beach where people swim. Their houses - extremely primitive. Pacific Ocean - approaching Lima from plane.